I visited Millen Farm at Samford yesterday for their International Compost Awareness Week event. It was a real pleasure to listen as Costa, from Gardening Australia, shared his passion for everything from plants to people. Costa talk helped me understand how this community project really can show how we can create a sustainable urban farming system. Costa painted an inspiring word picture of small under utilised private and public places in our cities being recreated as productive food sources. Costa also highlighted the contribution, Millen Farm’s focus on training young people, is making to our future food security: Learn, Grow, Feast. 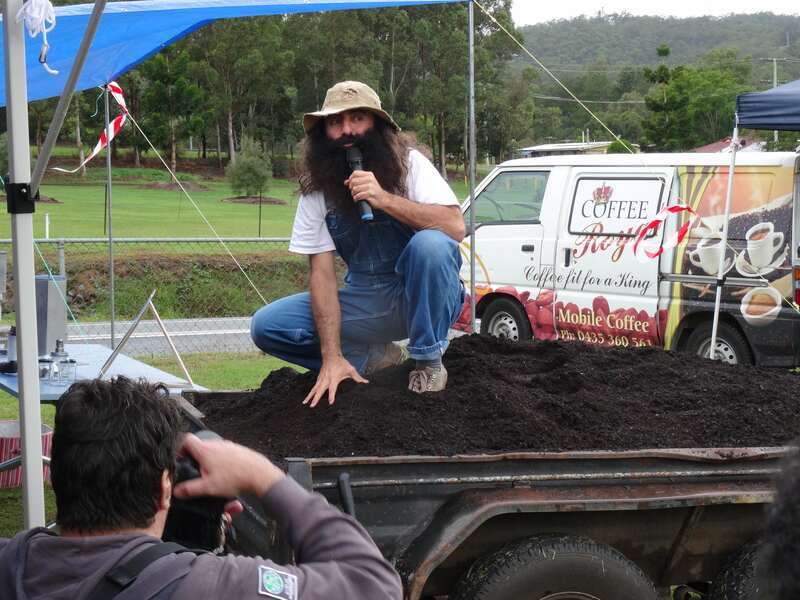 Costa was at Millen Farm in his role as Ambassador for International Compost Awareness Week (ICAW). “Down to earth” inspiration also came from Eric Love, Chairman of not-for-profit Centre for Organic Research & Education Inc. (CORE). Eric spoke passionately about keeping our food and garden waste out of land fill and using this underappreciated resource in creative new ways to not only grow food but also clean our urban storm water runoff before it enters our rivers and bays. What is really powerful is discovering that this environmentally focused not-for-profit has translated research into products with an international market: Stormwater Treatment And Reuse – STAR Water Solutions. 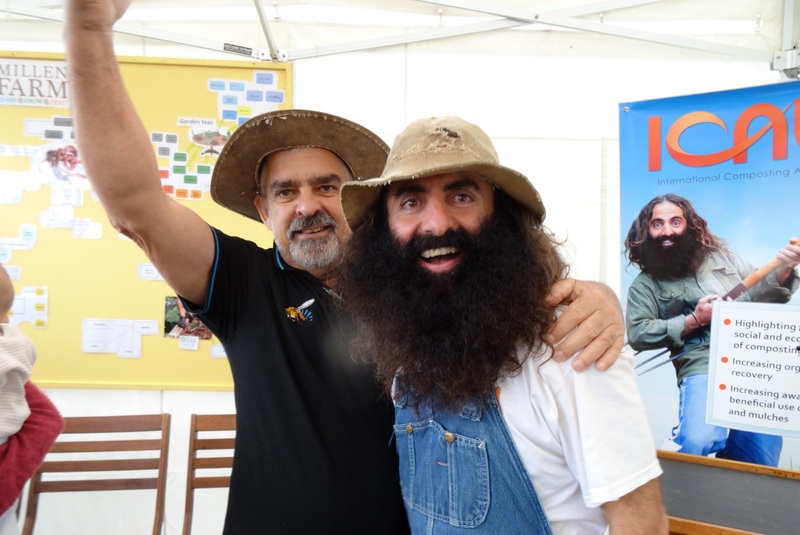 ICAW Ambassador “Costa the Composter” understands that earth is the foundation for productive communities, farms, gardens, even innovative businesses like STAR Water Solutions. In his own style Costa showed us how to get in touch with the important things by jumping up on a trailer load of beautiful rich compost. 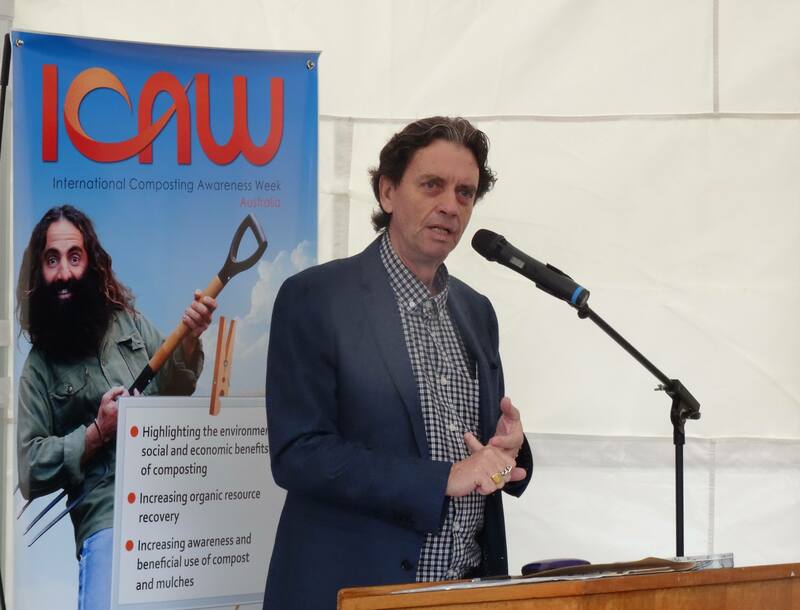 I also met Peter Storer a passionate driving force behind the Samford Eco-Corridor project is focused on improving the area around the river at Samford Parklands. A long-­term project that involves clearing the area of invasive weeds, replanting with indigenous species, and creating a natural corridor that enhances the ecosystem, protects the river and provides a natural area for the benefit of people as well as wildlife. Peter explained how the project has expanded to focus on researching local flora and fauna then applying that research in working with land owners along the waterways to recreate the original plant species diversity for the area. Following the theme of passion and innovation, Bob The Bee Man demonstrated his hive design for Stingless Native Bees Tetragonula sp. that allows for easy honey extraction. Patented separators allow for simpler access, a panel of spikes is used to open the honey cells ready for loading into the centrifuge for extraction with a cordless drill. A classic story of Aussie innovation. 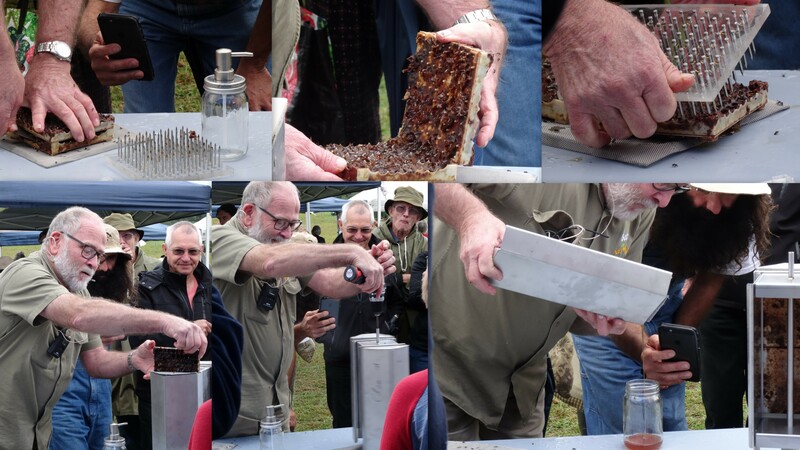 Bob is running a Collecting stingless bee honey workshop at Millen Farm on May 28. 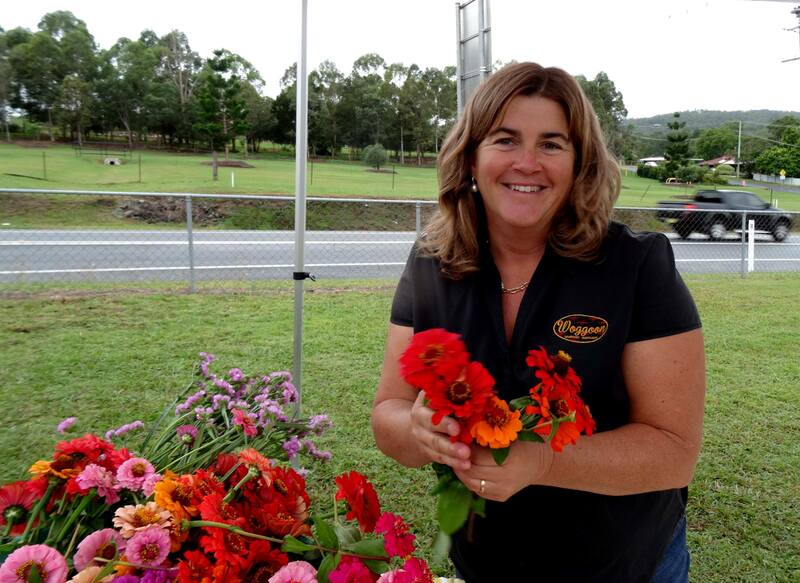 I also learnt about edible flowers from Debbie of Woggoon Farm who grows and sells Zinnias and Nasturtiums with petals that can be used in everything from icecream to wedding cakes. Debbie is passionate about growing and selling her flowers, however, I think she would grow them just to feed her native bees if necessary. Common Spotted Ladybird Harmonia conformis. Ladybirds are valuable pest controllers in your garden eating Aphids, Mealy Bugs and other garden terrorists. This entry was posted in Bees, Pollinator Link, Wildlife Corridor and tagged Bob The Bee Man, Common Spotted Ladybird - Harmonia conformis, Costa the Composter ICAW Ambassador, Debbie Needham Woggoon, International Compost Awareness Week, Millen Farm, Native bees, Samford Eco-Corridor, Star water solutions, Zinnia. Bookmark the permalink.